The term bio-inspired materials or biomimetic materials refers to those materials whose structure or composition is based upon natural biological substances, and serve many objectives in an appropriate and simultaneous manner. Most of these systems are complex but they are composed of simpler components, both organic and inorganic, which are assembled to form a final synthesis which has much better properties than those of any of the components individually. These biological systems have excellent mechanical properties, and are formed in marvelous processing conditions involving watery environments. This is in intriguing contrast to the stringent and extreme conditions of extreme pressure and/or temperature under which similar manmade materials with somewhat similar properties and performance are produced. The organization of these biological structures displays a clear hierarchy all the way from the macrostructural to the nanolevel, or molecular scale. It is necessary to understand the structure at each level to successfully replicate the mechanisms of action of each of these materials. 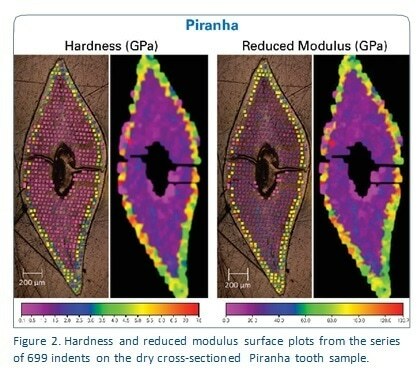 In the present study, nanoindentation tests were carried out on a single Piranha and a single Great White Shark (GWS) tooth sample, using a Hysitron® TriboIndenter® device. The tooth samples were first embedded in epoxy before being polished into a smooth cross-sectional surface to prepare them for testing. The nanoindentation tests were conducted on the samples with the help of a diamond fluid cell Berkovich probe. The test conditions were uniform, consisting of a feedback mode that was load-controlled to a peak force or high point of 1000 µN. The load function used consisted of one loading to peak force segment of 5 seconds, one hold segment of 5 seconds and finally an unloading segment of 1 second. Indent maps were first automatically created over the whole surface of the sample, at indentation distances of 50 to 100 µm, and then the samples were placed in D-PBS for hydration for about 2 hours. Testing was performed after this period, with 20 more indents being made using identical load function, over both the dentin and the enameloid parts of each sample. This provided a comparison between the mechanical properties of the teeth when they were dry and hydrated. 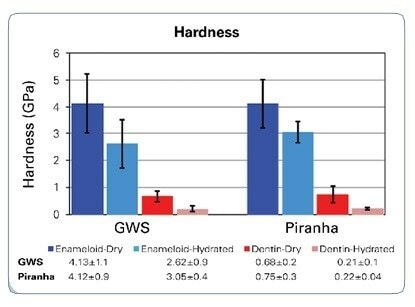 The two different samples were alike in showing an approximately five-fold increase in hardness from the inner dentin at 0.7 GPa to the outer enameloid region at about 4.1 GPa, the latter being the protective layer. 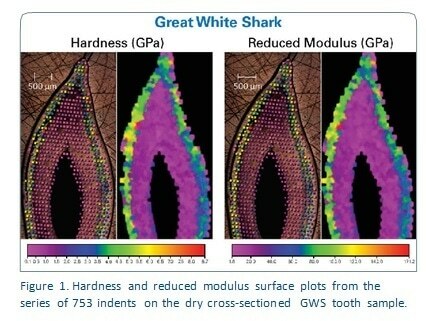 The modulus showed the same trend from about 21 GPa to 85 GPa from the inner dentin to enameloid layer. Figure 2 shows the surface plots showing the results of indentation of each of the samples. When these are analyzed it provides a wealth of information about the mechanical properties of these marine teeth samples. It reveals that hydration reduces the hardness and modulus of the dentin but not the enameloid, due to the high mineralization and low percentage of water and organic components. 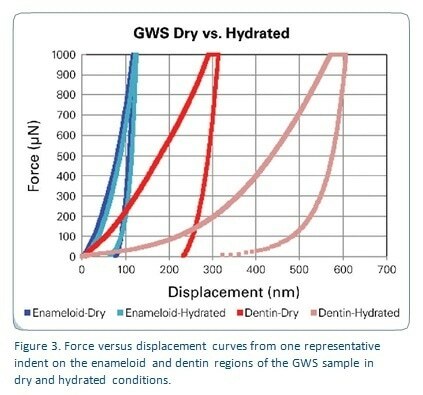 Figure 3 shows some force-displacement curves from the GWS indentation test to represent these changes in the mechanical characteristics of different regions, depending on the degree of hydration. 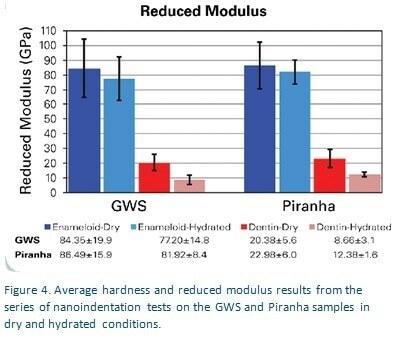 Figure 4 presents a direct comparison of indentation in dry versus hydrated conditions. In the current experiment, the nanoindentation trends were comparable to previous experiments to measure the microhardness on other samples. Enameloid and dentin parts of a GWS showed microhardness to be 1.56 and 0.31 GPa, respectively, under dry testing conditions, using indents of approximately 60 µm at about 200 µm distance between them. On the other hand, the size of the nanohardness indents was about 2 µm with 75 µm distance between them. When the size of the biological material is small, only a few microindentation points can be used for data acquisition, which makes nanoindentation the method of choice when testing such samples. Chen, P.-Y., et al., “Structure and mechanical properties of selected biological materials.” Journal of the Mechanical Behavior of Biomedical Materials, 1 (2008) 208-226. Chen, P.-Y., et al., “Predation versus protection: Fish teeth and scales evaluated by nanoindentation.” Journal of Materials Research, 25 (1) (2012) 100-112.